Shelf Life of Happiness: Stories by Virginia Pye from Caitlin Hamilton Marketing & Publicity for review in October. In these bittersweet, compelling stories, Virginia Pye’s characters in Shelf Life of Happiness long for that most-elusive of states: happiness. A young skateboarder reaches across an awesome gap to reconnect with his disapproving father; an elderly painter executes one final, violent gesture to memorialize his work; a newly married writer battles the urge to implode his happy marriage; and a confused young man falls for his best friend’s bride and finally learns to love. In each case, Pye’s characters aim to be better people as they strive for happiness–and some even reap the sweet reward of achieving it. They Gathered at Rosings by Margaret Lynette Sharp, a free kindle book. FRITZ HABER — a Nobel laureate in chemistry, a friend of Albert Einstein, a German Jew and World War I hero — may be the most important scientist you have never heard of. The Haber-Bosch process, which he invented at the turn of the twentieth century, revolutionized agriculture by converting nitrogen to fertilizer in quantities massive enough to feed the world. The invention has become an essential pillar for life on earth; some two billion people on our planet could not survive without it. Yet this same process supplied the German military with explosives during World War I, and Haber orchestrated Germany’s use of an entirely new weapon — poison gas. Eventually, Haber’s efforts led to Zyklon B, the gas later used to kill millions — including Haber’s own relatives — in Nazi concentration camps. Haber is the patron saint of guns and butter, a scientist whose discoveries transformed the way we produce food and fight wars. His legacy is filled with contradictions, as was his personality. For some, he was a benefactor of humanity and devoted friend. For others, he was a war criminal, possessed by raw ambition. An intellectual gunslinger, enamored of technical progress and driven by patriotic devotion to Germany, he was instrumental in the scientific work that inadvertently supported the Nazi cause; a Jew and a German patriot, he was at once an enabler of the Nazi regime and its victim. Master Mind is a thought-provoking biography of this controversial scientist, a modern Faust who personifies the paradox of science, its ability to create and to destroy. It offers a complete chronicle of his tumultuous and ultimately tragic life, from his childhood and rise to prominence in the heady days of the German Empire to his disgrace and exile at the hands of the Nazis; from early decades as the hero who eliminated the threat of starvation to his lingering legacy as a villain whose work led to the demise of millions. Nora & Kettle by Lauren Nicolle Taylor, a free kindle download. Remember When by T. Torrest, a free kindle download. Rise of the Fallen by Donya Lynne, a free kindle download. After an immortal life that’s been more agony than joy, Micah wants his endless suffering to be over. So he seeks out a ruthless enemy who’s more than happy to end his life, only for his death wish to be thwarted by a beautiful, gun-toting female who looks more angel than human. Samantha is hiding from her abusive ex-husband, dancing for men’s favor–and their money–in a swanky gentleman’s club in order to pay the bills. While leaving her nightly shift, she stumbles upon a group of thugs beating a helpless man to death. She charges into the fray, guns blazing, determined to save the handsome stranger, only to discover he’s no man, and she’s thrust herself into a dangerous, paranormal world she never knew existed. In Sam, Micah finds a reason to live, but now that she’s put a target on her back, he’ll have to go to extreme measures to protect her. But with her obsessive ex-husband closing in and an enemy who will stop at nothing to exact revenge, are the odds stacked too heavily against Micah? Or will finding something worth fighting for be enough to give him the advantage? Chocolate and Conversation by Jennifer Griffith, a free Kindle download. Mormon girl Susannah is ready to take a big risk. Suddenly unemployed and unmarried, Susannah puts everything on the line to open up downtown Salt Lake City’s first all-chocolate café, The Chocolate Bar. It all starts out sweetly. Susannah even catches the interest of the city’s most eligible bachelor, a charismatic attorney. But when Susannah’s first love, John Wentworth, returns to town, her heart goes sideways. He’s rich. He’s handsome. And he’s got intentions of marrying anyone but Susannah. Chocolate and Conversation is a light and frothy, chocolate-filled romp. An adaptation of Jane Austen’s Persuasion, it’s filled with to-die-for recipes, hilarious situations, and swoony kisses. This delicious romance throws a wholesome girl into an impossible love triangle between her longing for her former Mr. Right and her Mr. Maybe-Right-for-Now. The Secrets of Pemberley by Rose Fairbanks, a free Kindle download. Henry Fitzwilliam’s War by Don Jacobson, a free kindle download. But, it is his two weeks spent recuperating at the Beach House in Deauville, after being temporarily blinded by chlorine gas, that irrevocably changes his life forever. There he encounters an incredible woman, one who will define his near 10-year search for the love of his life after he returns to his own time–and how his personality was shaped by their emerging relationship…one that was impossible on a number of levels. 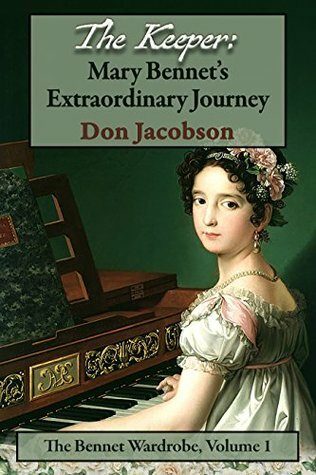 Don Jacobson is visiting the blog today to talk about his series of books, The Bennet Wardrobe series. Of course, there are 8 ebooks up for grabs as well. Stay tuned for the giveaway! The Bennet Wardrobe Stories have grown out of Don’s interest in the side characters found the in majestic “Pride and Prejudice.” He feels that the three younger sisters have been left to languish these past two centuries as readers…and writers…have focused on the eternal love story of Fitzwilliam Darcy and Elizabeth Bennet. Recognizing that, perhaps, Mary, Kitty, and Lydia as well as their father, Thomas, need to resolve their inner personality issues, much as both Lizzy and Darcy did in the original, to become characters in full. Please give Don Jacobson a warm welcome. The Bennet Wardrobe Series is an alternative history in the Pride & Prejudice Universe. While the lead characters are familiar to all but only as secondary personalities, I have endeavored to provide each of them (Mary, Kitty, Lydia, and Thomas) with an opportunity to grow into three-dimensional persons, although not necessarily in the Regency. If they were shaped or stifled by the conventions of the period, the time-traveling powers of The Wardrobe helped solve their problems, make penance, and learn lessons by giving them a chance to escape that time frame, if only for a brief, life-changing interlude. The Wardrobe underlines my conviction that each of these characters could enjoy fulfilling lives once they had overcome the inner demons holding them back. Perhaps. However, something tickled my brain—maybe it was the intersection between my youthful fascination with speculative fiction and my mature appreciation of Austen—that suggested that it would be fun to try something different. How about time travel? Not unknown in JAFF … but usually played for farce rather than something more profound. With careful treatment, though, protagonists could be immersed in different futures to learn that which they need in order to overcome the limitations preventing them from realizing their potential as people. In the process, they carry the eternal story of love and life forward even to the 21 st Century. The saga of The Bennet Wardrobe begins with The Keeper: The Extraordinary Journey of Mary Bennet. 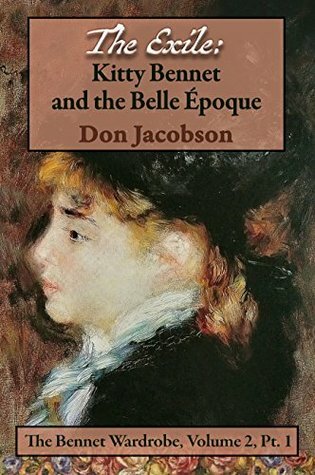 The Exile: Kitty Bennet and the Belle Époque is Volume 2, Part 1. Four more novels will complete the story of the Wardrobe’s agenda. Three novellas have previously been published. More will be written to enable me to understand the manner in which the Wardrobe and the Bennet family interact. These will give readers insight into my process. Astute bookworms, upon encountering The Bennet Wardrobe will immediately leap up and cry, “Ah-hah. I’ve got this. Jacobson has taken Narnia and tossed it back into the Regency.” Yes and No. Obviously there is a relationship between Lewis’ Wardrobe and The Bennet Wardrobe in that they are both portals to other places or times. But, that is where I believe it ends—these devices are both Wardrobes, but have different properties. I subscribe to the idea that the act of imagining characters (and the Wardrobes certainly are characters) brings them into reality. I follow Robert A. Heinlein who believed in … “World as Myth” — the idea that universes are created by the act of imagining them, so that all fictional worlds are in fact real and all real worlds are figments of fictional figures’ fancy …“1 For instance, in Chapter XXIII of The Exile, Holmes refers to Pride & Prejudice as if it is a nonfiction book. Thus, The Bennet Wardrobe, the Narnia wardrobe, The King’s Roads, the TARDIS, and the flue network do exist because their universes have been created through their authors’ imaginations. But, I needed to place The Bennet Wardrobe within the context of a rather fertile field of British Magical Transport. As I have written novellas to understand characters, so, too, did I compose a mock academic article (which appears in The Keeper) exploring the place of The Bennet Wardrobe within the spectrum of British magical transportation. Humans have traditionally found security in dim and enclosed spaces, from the caverns of 150 generations ago to more modern architectural innovations like the closet. These have one common thread…they are sealed off and dark, safe; wrapping a person seeking sanctuary in a womblike cocoon and capable of transporting one to other worlds—real or imaginary. So, it came as little surprise when I discovered that the closet’s predecessor, the wardrobe, offered similar characteristics. Just as a child may inherit a mother’s nose or a father’s eyes, the closet may yet carry some special properties held by what had once been a fixture throughout the homes of the well-heeled classes of post-Restoration Britain and ancien regime France. With the Industrial Revolution, wardrobes eventually became quaint relics. But, they did not lose their capacity to transport users across time or space. Professor C.S. Lewis incisively revealed the power of the wardrobe with his groundbreaking Chronicles of Narnia. The knowledge of this capability stunned post-World War II audiences. Further research discovered other avenues over and through which properly attuned mortals and immortals could pass. Ms. Rowling highlighted the unique nature of the flue network used by witches and warlocks. Another excellent study of Britain’s magical transportation network can be found in Susanna Clarke’s stunning work, Jonathan Strange & Mr. Norrell. Her discussion of the King’s Roads that were hidden behind Britain’s mirrors revealed the extreme age of Britain’s magical transport. Another important mode was the wonderful looking glass described by Mr. L. Carroll. The British King’s Roads were rooted in pre-Roman and medieval powers obscured after the 15th Century. The rising powers of late 18th Century wardrobes may have been a response to a need caused by the disuse of the King’s Roads. Both the Narnia Wardrobe and The Bennet Wardrobe are considered prime examples of classic Wardrobes. Researchers have cursed the Luftwaffe for destroying the Narnia Wardrobe in the Blitz. While Wardrobes were not a perfectly safe mode of travel, they, none-the-less, seemed tamer. Potter’s more modern and dependable flue network (splitching aside) may have been implemented by Britain’s magical beings as, with the introduction of the closet, the wardrobe passed from common use and availability. Even so, each network had its own properties and rules that governed its use. Lewis, for instance, explored the “need based” nature of the wardrobe. For the children of wartime Britain, they had to escape from the horrors of the events that swept over them. Hence, the doorway to Narnia led to another world where these youngsters had complete agency over themselves as the heroes in the epochal battle between good and evil. The Bennet Wardrobe has been discovered to be equally potent, but in a different manner. Rather than transporting users to another world, this remarkable cabinet discerns the true needs of the Bennet user and ascertains what is required to meet that need. Then the Wardrobe transports the Bennet to a future time where that requirement can be fulfilled, but only to a frame of reference upon wardrobe’s timeline—a point in time and space where the wardrobe itself exists. Because of its unique construction, the Wardrobe is attuned to the peculiar vibrations of those born of the lineage of Mr. Christopher Bennet, the first Bennet Master of Longbourn Estate. No non-Bennet has ever directly taken advantage of the properties of the Wardrobe. Mrs. Fanny Bennet could only use the Wardrobe to hang a pelisse or store a hat—if Mr. Bennet would let her in the library! Thank you, Don Jacobson, for sharing your inspiration for the Bennet Wardrobe.